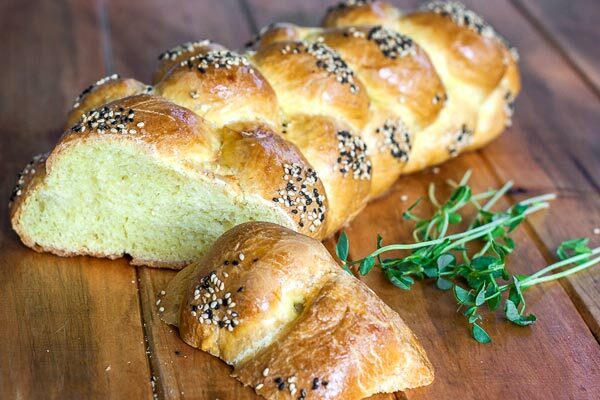 Challah is a special Jewish braided bread and it’s similar to the easter bread as in they both have eggs. Traditionally they are braided in 6 pieces, but you can do it in 5 or even 3 pieces as well, it’s totally up to you. Anyway my challah turned out wonderful and very tasty. You may sprinkle poppy seeds or sesame seeds on them. As with any bread, we need to get the yeast ready. In a small bowl, add the water, ¼ cup of flour and the yeast and mix well. Let this sit for 10 minutes for yeast to activate. 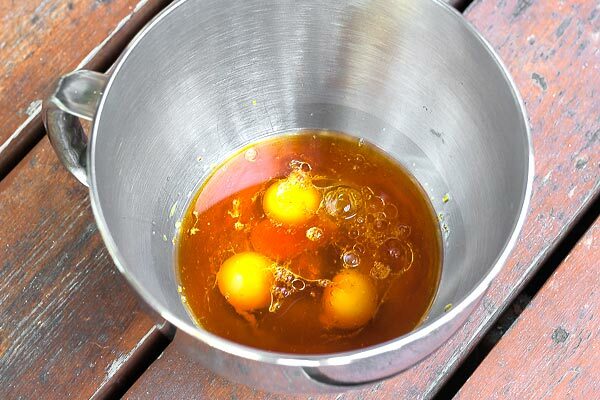 While the yeast is activating, in the bowl of your mixer, add the oil, honey, salt and crack 3 eggs. I added a bit of saffron dissolved in a little water in case you were wondering about the color. After 10 minutes, the yeast mixture more than doubled, so take that and add it to the mixer bowl (the one with the eggs) and give them a swirl. Next you need to add a cup of flour at a time to this mixture and use the dough attachment to combine them perfectly. Add your last cup of flour and do a bit of kneading on a floured surface. You should end up with a nice ball of dough. Oh, and I did use a bit of saffron for colour. After that oil the dough, cover with a plastic wrap and give a couple of hours time to rise. When you are satisfied with the result, put it on a floured surface and it is time to shape the bread. Cut the dough into 2 pieces and set one piece aside. Cut one of the pieces into thirds, then each third cut it in half, so we end up with 6 equal pieces. 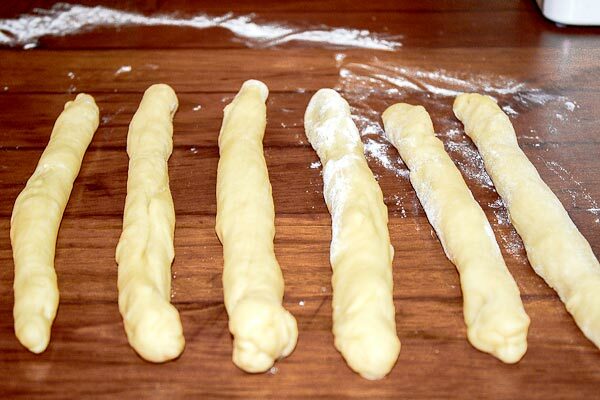 Roll out each piece of dough into long cigar shaped pieces. They should be a bit longer than 1 foot (30cm). Unfortunately I cannot show how I shape the bread. Enough said that after tons of videos watched on youtube and some beer, I managed to make it… I think. Personally I kinda liked it. Your next step would be to place them on a lightly oiled stone [duh! ], or you can just use a silpat. Let them rest for about an hour as they will probably double in size again, and then add some poppy seeds or sesame or both, and brush a little egg wash on top of it. Bake them for about 35 minutes and enjoy! It is well worth the effort. In a small bowl, add the warm water, ¼ cup of the flour and the yeast, whisk all together well and let it sit and proof for about 10 minutes until the mixture starts growing and bubbling. In the mixing bowl of a mixer, add the yeast mixture, the eggs, vegetable oil, salt and honey. Mix well together then using the dough attachment gradually add the remaining 3¼ cup of flour, adding 1 cup at a time. Remove the dough from the mixer and place it onto a floured surface and knead it for a couple more minutes. 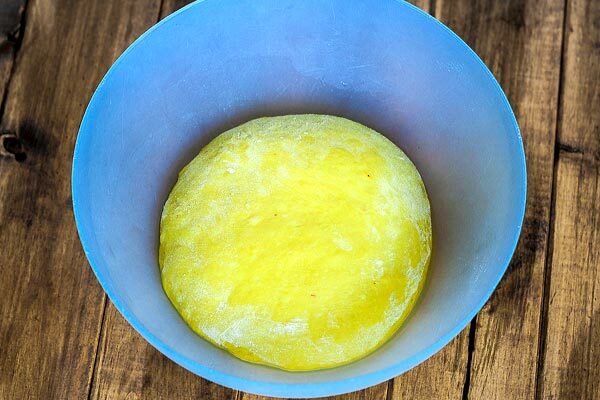 Place the dough in a greased bowl and let the dough rise in a warm place until it doubles in size. 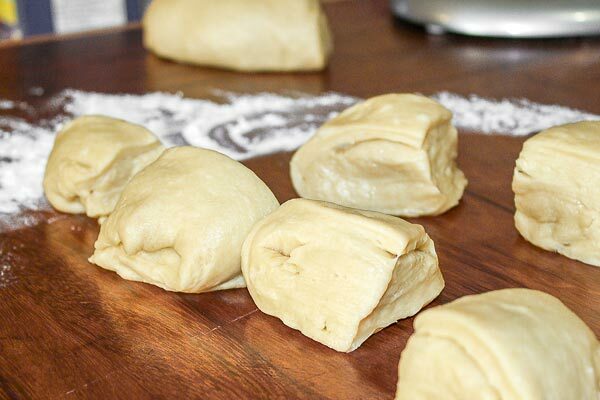 After the dough doubled in size, divide the dough into 2 equal portions. In turn divide each piece into 3 equal portions. 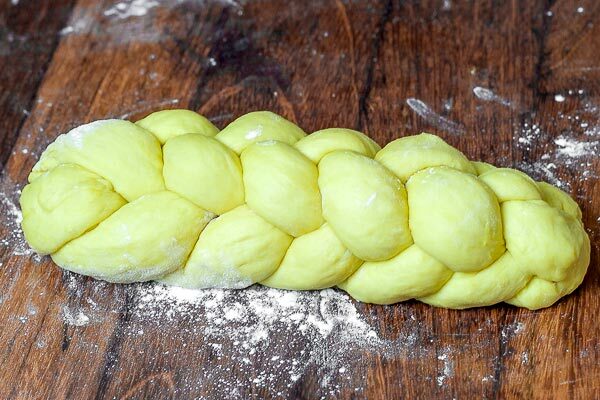 Using 3 of the pieces braid it into a loaf. Repeat with remaining 3 pieces. 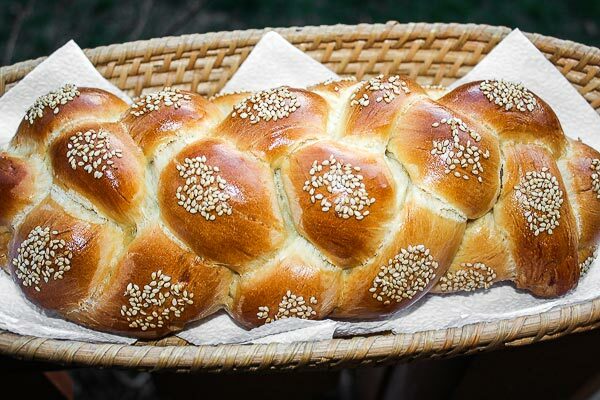 Myself, I wanted to braid it into 5 pieces, so I divided each into 5, the bread turned out really beautiful. Place the breads onto a baking sheet, and let the bread double in size again. Once doubled, brush the breads with the egg wash. At this point you can sprinkle either poppy seeds or sesame seeds on it. Bake the loaves in a preheated oven at 325° F / 162° C; for about 25 to 35 minutes or until nice and golden brown.